Last year Israel’s SUPaway Surf Club orgainsed a group paddle where they attempted to paddle across four of Israel’s unique waterways. Here Karine Roch reports what went down as well as giving an overview of a very unique stand up paddle boarding destination. I’m going to tell you about a SUPaway Surf Club road trip in Israel, where we went to SUP at four seas in four days. You’ll be surprised to hear that Israel is a great destination for SUP, surfing, windsurfing and kitesurfing. You’ll discover that Israel offers varied and unique conditions, all within a small distance. In our journey we’ll visit surf breaks in the Mediterranean, SUP where Jesus walked on water – the Sea of Galilee – and on the Jordan River which flows down to the lowest point on earth, the Dead Sea, then finally head to the forever sunny town of Eilat. The southern point of Israel allows paddlers to SUP over coral reefs in the Red Sea. All this within 400 km from north to south. We headed off in the afternoon towards Tibearias and arrived just in time for a sunset paddle on the Sea of Galilee. Although called a sea it is really a lake, surrounded by the Golan Mountains – which are luscious green in winter, while in summer they are dry and yellow. The look and feel of the beaches that surround the entire lake change according to the local geography, creating different landscapes as we paddled along the lake shores. We camped right on Leedo beach and, with a full day ahead, we woke up at 5am for an amazing sunrise paddle. SUPing on the Sea of Galilee is a great way to explore this lake, enjoy the view and paddle by where Jesus walked on water and held his last supper (no pun intended – Ed). Just half an hour away, we drove to explore the Jordan River. In winter the river can be a grade 5 rapid but water levels get much lower through summer – when it can just be a cruise down stream. The Jordan River is also famous as the place where Jesus was baptised and nearby are lots of interesting historical and archaeological sites to visit including Kasser el Yahud, the actual site of the first baptisms and Capernaum where the 12 apostles were chosen. Our next sea is the Mediterranean, where we stopped in Akko (a.k.a Acre), a biblical seaside town with a rich history and one of the only cities that has been continuously inhabited from BC to this day. The city is fortified by a tall stone wall, which still exists, and we paddled along it in the Akko bay. To finish off we stopped for freshly caught seafood in one of the local restaurants built along the wall, overlooking the bay and the Carmel mountain. Our home base, Michmoret, is located in the centre of the country and is a small surfing (once fishing) village. This is where SUPaway Surf Club is based and the hometown of its founder, Amit Inbar, a former Olympic athlete and windsurfing world champion. This village is the SUP and surf hub of Israel, with a big variety of beach and point breaks to ride on when the swell is pumping. When it’s not, it’s a great location to explore the beautiful Mediterranean coast and even paddle from the sea into the nearby Alexander River. While paddling on the river you’ll encounter lots of birds, fish and even freshwater turtles. The Alexander River is a National Park and requires special permission to paddle on. It’s a fun 8km paddle. About halfway down the river we stopped along the banks for some refreshments and turtle watching before heading back. We continued south, just another two hours, experiencing dramatic variation in scenery and geography in such a short distance. The view from the car slowly changed from green fields and trees to dry, tan coloured mountains with sporadic vegetation. Following the winding road down, we reached the Judea desert mountains and the Dead Sea. At 400 metres below sea level, the Dead Sea is the lowest place on earth. Nestled among the rough, mountainous terrain of the Judean desert, it is an oasis of beauty, relaxation, calmness and excitement. On the northern part of Dead Sea, which has remained wild and untouched, is where SUPaway guided the group on a super special SUP experience paddling on this seemingly thick, dense, deep turquoise, mineral rich water. Not only is it nice and sunny, but the sun’s UV rays do not burn or harm you as they would normally due to the low altitude. 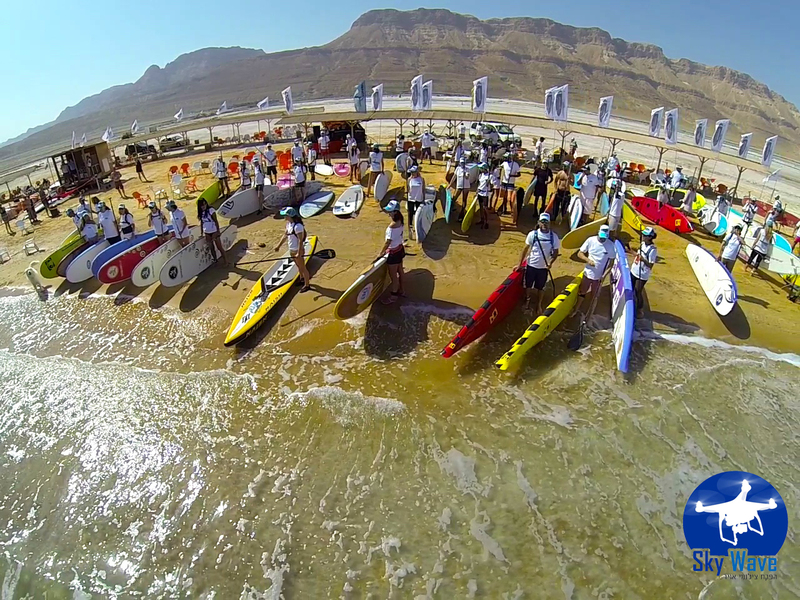 SUPaway were the first to SUP the Dead Sea several years ago and have since made it a club winter tradition. 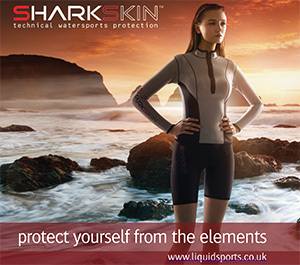 One of the great things about SUP is that you can explore places that can’t be reached by neither car nor foot, and we discovered secret natural bubbling hot water pools with unique, mineral rich black mud – a natural nourishing mask to cover your whole body with. We all covered ourselves in it and basked in the sun. From the Dead Sea, we continued driving three hours further south. The desert mountain becomes a deep red and when the road ends you have reached the southernmost point of Israel – the forever sunny Eilat. If you want to experience summer during winter time, Eilat is the place to do it. There’s the opportunity to enjoy all watersports here including SUP, kiting, windsurfing, scuba diving and snorkeling. Our first paddle on the Red Sea was full of surprises. We paddled above the corals, following the colourful fish, and were met by two dolphins from the local pod who were taking a morning swim. This dolphin pod lives in the bay of Eilat permanently and, while free to leave and explore whenever they want, they mainly stay in their bordered area that’s known as Dolphin Reef. We paddled for hours, soaking up the scenery and the sun, and finished the day with Watsu treatments overlooking the bay. A couple of days in Eilat were the perfect finish to our SUP safari and it felt as if we had traveled to far countries. It was time to head back to Michmoret; some of us caught the one hour flight while the rest headed on the four hour car ride back to base. 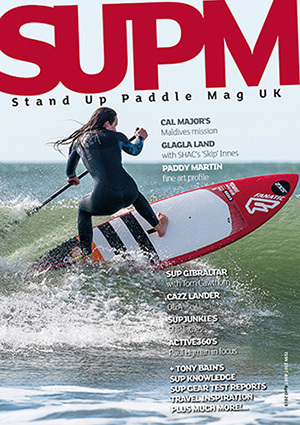 Basically you can SUP all year round! The Mediterranean is great for paddling and exploring. From October to April you will be able to get some decent waves, while in summer time smaller surf provides a great playground for SUPs and longboards. Recommended season is between October and June. In Eilat, some days during spring and autumn you can encounter strong northerly winds, great for exploring the Eilat bay. On other days you will find glassy water, perfect for exploring the reef and meeting the local dolphin pod. Supaway is a retail, rental, guide and instruction surf club and shop located at Michmoret beach. 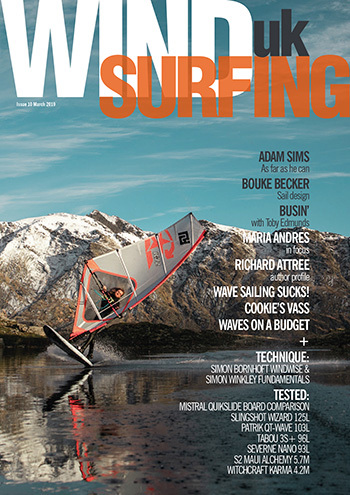 They offer a wide variety of rental boards including race SUP boards to carbon surf SUPs – all sizes and types. SUP, surf, kite and windsurf lessons are available (private or group) from top notch instructors. Guided tours are also offered, from a few hours to full day or multiple days, and can be tailored to your needs. If you really want to explore Israel by SUP and reach all these unique spots and other secret spots, Supaway will take you and your friends on an unforgettable journey with accommodation, transport and equipment from start to finish all provided.